Editor's note: This post features sponsored content paid for by Prysm, Inc.
New visual collaboration solutions are making it easier for teams to work together and dramatically increase speed to market while reducing costs, but companies first need to address the collaboration gap and understand the key criteria for selecting a solution that will close the gap and empower the workforce to meet, or surpass, their own potential as well as the goals of the organization. A 2016 study conducted by Forrester Consulting examined the effectiveness of collaboration technology in the enterprise. The firm surveyed 1,000 professionals at organizations in the US and the UK—all companies with 1,000 employees or more. Two hundred of those surveyed work in IT and facilities, and 800 are “information workers”— those who would benefit from, and work directly with, collaboration systems. The study found that while 51 percent of IT/facilities workers believe their organizations provide sufficient collaboration tools, only 26 percent of the information workers surveyed say this is the case. This discrepancy points to a significant collaboration gap between IT and management and the end users of the collaboration technology. 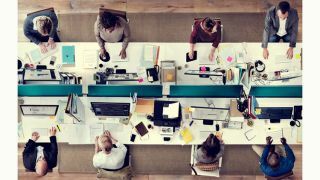 The study also found that 49 percent of IT/facilities professionals believe there is already adequate space in their companies’ offices for effective collaboration—but, again, only 26 percent of information workers agree. In addition, 45 percent of these workers said that even in supposedly technology-enabled meeting environments it’s difficult to engage all participants, whether on-site or remote. Another important finding of the Forrester study is that employees are often not “in the office” when they’re working (see Figure 1). Forty percent of respondents said they go into the office five days a week, which means that the other 60 percent are working regularly off-site. From a collaboration perspective, this means that meeting the needs of remote participants, so that they can contribute effectively to sessions, is increasingly important. The Forrester research points to a “Mobile Mind Shift”—the expectation among workers and customers that they can get what they want in their immediate context and moment of need, using a mobile device—that changed work forever, and the business pressure to find holistic, productive collaboration solutions to fit the new landscape is high (see Figure 2). But it’s not just about accommodating a more mobile workforce. Office-anchored collaboration needs, as well as customer-focused ones, are also rapidly evolving. So what key criteria should you consider as you evaluate prospective visual collaboration technology vendors to close the gap and build a modern digital workplace? •Content and application compatibility. Your organization relies on many different types of content, such as documents, dashboards, whiteboard sessions, field video, Web-based mapping software, 3D models, 2D models, and data visualization tools, to name a few. A good visual collaboration platform allows you to use all of your current tools and file types in a unified visual workspace, so it will enhance your workflow, not detract from it. •Accessibility. Since your workers are always on the move, your new collaboration platform should give workers real-time access to any kind and quantity of content, regardless of location, so they can actively participate in meetings and work sessions. Look for flexible, cloud-based solutions (public, private, or hybrid) that enable simultaneous access from laptops, tablets, and smartphones, as well as from large displays in conference rooms and auditoriums. •Integration with your existing infrastructure. It’s smart and economical to leverage your existing technology investments, as well as your workforce’s knowledge of your internal systems. As you evaluate vendors, make sure that the platform is fully compatible with your conferencing and collaboration tools, such as Cisco TelePresence tools, Polycom HD video and teleconferencing systems, and more. The platform should work with all unified communication options and not be a limited platform that is too “app-based” (such as providing only screen shares, as opposed to being able to sync in real time, for example). •Enterprise-grade security. If you’re in an industry that requires a “behind the firewall” solution—government, banking, healthcare, insurance, or other security-sensitive industries where data must be stored on premise, not in the cloud—it’s important to make sure that your collaboration platform can accommodate this. •Content persistence. While we think of meetings as events with a beginning and an end, meetings are often waypoints for large projects. Look for a vendor that offers true content persistence so that your documents, videos, Web pages, whiteboards, annotations, etc. exist in a workspace after your meetings end. The platform should be able to preserve and instantly restore your sessions exactly where you left off in the last meeting. This way you can finally say goodbye to locking conference room doors for hours, days, or weeks to preserve the content for the next meeting and prevent it from being erased or altered. •Ease of use. Evaluate the amount of training necessary for your organization to adopt your new platform. Seamless hardware and software integration may play a role in this. Additionally, the product should be easy to use and the vendor should provide readily available education and training. •Total cost of ownership and return on investment. Look for a solution that is greater than the sum of its parts— not just a technology solution but an investment that will pay its way, lead to greater efficiency, and contribute to the growth of your enterprise.